Due to the steepness of the main part of the Island, it is not surprising that there are a number of waterfalls, despite its small size. Obviously our rivers are not large as they only have to travel a maximum distance of some 5 miles or so to get from the source to the sea, not that they go the shortest route however! Of these waterfalls some are easily accessible and some need much more effort and even a guide. It is important, particularly for the more athletic of our visitors to recognise that Tobago is not just beautiful beaches on a turquoise sea. We do have woodlands and rainforest and these are cooler and in ways even more beautiful than the beaches! So here is a list of some of the waterfalls and a few comments about them including a scale of difficulty to reach the falls. Black Rock: These are small falls reached by going up the road next to the tennis courts and passing the primary school. When you can see the river, you can climb down into it and follow it upstream. The falls are not far and can be climbed. Above them the river passes through the woodlands full of bird life. On any scales, this is easy but by no means the most beautiful. Providence River: If you take the Providence road to Les Coteaux you come down the hill where there is a turning on the right. This takes you down to the river and following this upstream you come to the falls. The river is narrow and full of rocks, it is not that difficult but needs good shoes to grip on the wet rocks. At the road there is an ancient aqueduct that took water to the old sugar mill just where you turned off the main road. 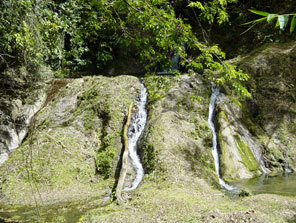 Courland River: This river has the highest waterfall in Tobago, Highland Waterfalls. Driving through Les Coteaux heading for Moriah, you continue straight on the old road past the shingled church, graveyard and the NEMA centre. The road down to the river is the first one on the right that you get to. This crosses a bridge and you take the left turn after that. You can either follow the road and cross the ford or follow the river. There is a short section where you may have to use the river, but this is manageable by any age. Before the waterfall is a large swimmable pool, you can swim this to access the waterfall or you can cross it and climb the rocks to get a good view of it. There is a tour guide who takes you to this river using off road vehicles. Craig Hall waterfall: This is the easiest to get to on the Island. Driving towards Moriah from Mason Hall, the waterfall is on the right hand side of the road just after the Craig Hall intake run by WASA. A short stroll down the concrete steps to the nicely placed seats gives a good view of the falls. There is no swimming allowed as the river goes from here to the mains at the Craig Hall intake. Hope River: Turning left before the bridge at the end of Hope beach you drive up this excellent and little used road to the first bridge. There is a track here down to the river. Upstream is a large pool filled by a waterfall. This is not climbable so back to the road and on to lamp pole no.81 where there is a wall and a track down to slippery rocks leading to small falls and a pool deep enough to bathe in. Upstream from here the river is shaded by large trees and then you reach more falls, all but the last climbable. There is one swimmable pool. You can scramble up the left bank before the pools to get back to the road. The first section from the road to the big pool is easy. Other sections include slippery rocks and some climbing. You need good shoes! Hillsborough River at Mt. St. George: Not easy to find , take the windward road to Mt. St. George and turn left uphill past the big white painted stone signposted to Hillsborough Dam. Take the first left a fair way up the hill and then left again at the phone box. This takes you down past the playing field to a grassy well kept roadway. Follow this down and you will see the remains of the sugar mill across the river at the ford. Follow the river upstream brings you to a series of cascades. Slippery when wet! Or downstream through some deepish water to another set of rocks which lead you to a series of small falls with one beautiful small pool for swimming in by an age! Further downstream you come to a dam, on the other side of this the river runs across a rocky slope (very slippery) and then off the edge to a very deep pool below. This is jumpable but scary! The way up is cautiously via the rocks on the side of the pool. Not so easy but to get to the ruins is easy and to the beautiful pool not so hard! Castara River: Opposite the primary school is a turning leading to the playing field. Cross the playing field and you come to path through woodlands. Follow this to the river. Follow the river upstream climbing over the odd fallen tree and criss crossing the river, you come to the falls with a small deep pool at its base. You can climb the rocks to get to the top of the falls, the river here runs through a narrow valley above which is the rainforest. A word of warning, rains here can come down with a vengeance and the rivers can flood in no time at all. At this point these normally calm waters can become a real danger to life and limb. Do not go river walking after a rainstorm or if there has been serious rain over the past few days before the hike. There are more falls on both sides of the Island and I will write about these in the next issue.